With Farm Chicks only 3 weeks away, the pressure is on. I have been trying to get all my painting done this week, but the weather has not been cooperating with my efforts so once again, my front porch has been looking a bit messy. I'm just hoping I don't get another letter from the HOA telling me to clean up my act. 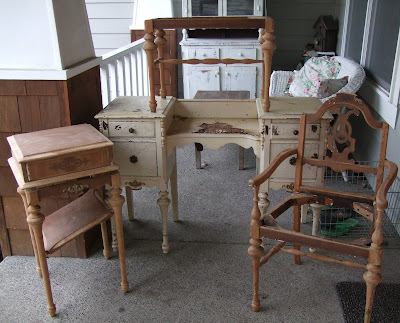 Remember this picture of the great antique project furniture I found on craigslist? Well, I finally managed to give everything a little make over. Here are the after pictures. I love all the curves on this chair. I wanted to put some of my vintage barkcloth on the seat, but didn't find one that was just right so I settled on this repro. barkcloth piece. I think it looks pretty. I'll most likely do a little distressing on this one. This is the bed side table. In the first picture it was all in pieces, but it wasn't too hard to put together. All the screws were there so that helped. I love the buttercream color this one is painted and a cute little glass knob is the finishing touch. Cute vanity bench, just needed a little sanding, some paint and a new seat cover. 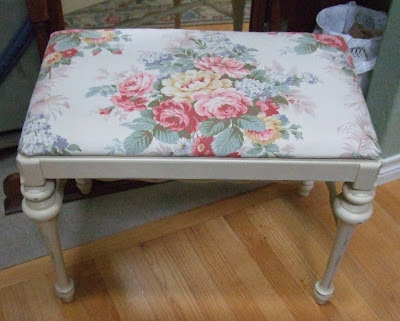 I used a pretty piece of vintage floral fabric I got recently on ebay. 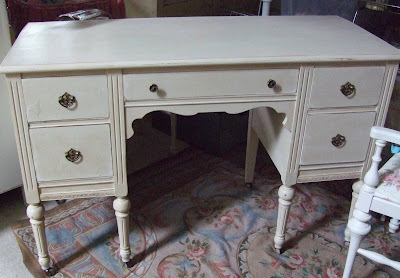 And finally, the vanity, which had a very sad center piece, became two night stands. I have seen people do this before, so don't get mad at me for taking this piece apart. The finish on these was perfect to begin with. Just needed a little cleaning. Ah...chippy goodness! I apologize for not taking more artfully arranged pictures. Everything is kind of a mess right now with completed projects tucked out of the way so I can work on other things that need attention. Here's another makeover project I completed this week. Unfortunately I had to remove all the veneer from the top and drawer fronts as it was in pretty bad shape and as a result, I lost some of the cute detail trim pieces. But overall, I think it turned out pretty cute. Kind of rustic looking. I gave it the same colors as the buffet I did (and showed a few posts back), but then I added an antique glaze over the whole thing. One thing I did keep from the original piece is the cool old hardware. I think it shows up a lot better now that the vanity is painted. I love that this one had the original wood wheels intact. That's it for me for this post. 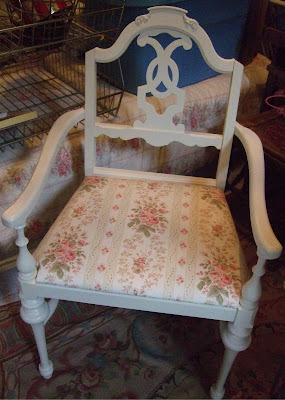 I'm still painting furniture and have been doing a little sewing too so I'm sure I'll have more to show you soon. You Rock when it comes to makeovers.. Great JOb.. Love all you did..
Wow! You did a great job! Everything looks pretty! Trying to decide which is my favourite piece and I think it is the vanity table that you turned into two nightstands. They look amazing, pity I live so far away! Geez you are good at restoring furniture!! I have to say you are such a genius at making over furniture! I wish I had that talent...I often see stuff that is crying out for a re-do, but think "It's a project I will never get to". You do such a lovely job. 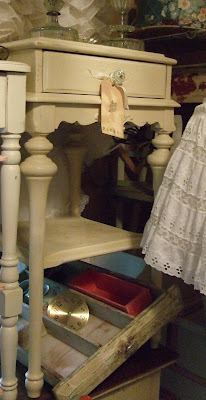 I really love the vanity/2 side tables...they look so French. Have a great time at Farm Chicks! All the makeovers are great Lisa! I love the way you turned the one piece into two nightstands...I've seen that before too. Love it! Good work! Fabulous transformations! I love how you gained two bedside tables from one vanity. I looked forever before I finally found tables similar to the ones you created. I love ALL of it! 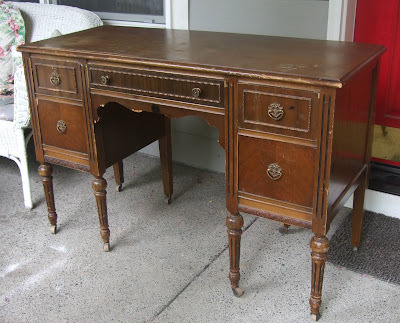 What color did you use on the vanity and what antiquing? That looks like the original old finish! Fantastic job! Someday I will go to the Farm Chicks show...I dream about it! WOW! My friend you have been so busy. All those pieces turned out beautiful. I'm thinkin maybe I need that desk for myself. You did an awesome job on the furniture pieces. That chair is my fav. The fabric is gorgeous. Everything looks fabulous! I really like the fabrics you chose. Awesome. Everything looks sooooo pretty!!! You really have been a busy little bee...Love the fabrics you used on the chair..
How I wish I have the time and talent for making things beautiful. Wonderful! Have a nice Tuesday!!! ¡Qué muebles tan bonitos!a mí me encanta restaurar los muebles antiguos,tienen más sabor que los de ahora,te felicito.besos. You HAVE been busy!!! Way to go! It all looks just devine and you have a way of turning and ugly duckling into a gorgeous swan.